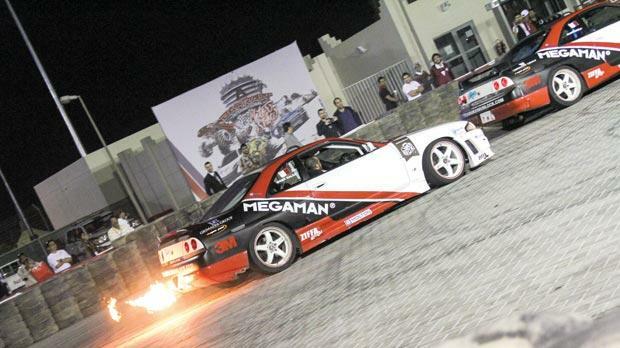 Maltese drifting outfit, Team Maximum Lock (TML), were recently invited to participate at the Bahrain International Motor Show which was staged at the F1 International Circuit in Sakhir. Transferring the team’s three vehicles to the Middle East from the present UK base was a logistical nightmare for TML. However, they were not ready to let this opportunity go by as their presence in the motor show was considered as an excellent sporting and business credential to the team. In fact, the three-day motoring bonanza in Bahrain brings together various performance car manufacturers for prospective buyers who get a chance to actually test vehicles at the 6.2km circuit that was launched in 2004 at a cost of over $150 million. TML did not require the entire circuit space to produce their show as their performance attracted a significant amount of interest from onlookers who showed their appreciation for the stunts performed by all three Maltese drivers – Chris Bezzina, Clint Abela and Mark Galea. The trip to Bahrain was a huge success for TML with a packed arena registered on all three days of the motor show. The team also featured prominently in the local media and some of the pundits were also confident that the Maltese team would be invited for future shows not only in Bahrain but also in the Middle East region where motor sport ranks high in popularity. Meanwhile, among those performing stunts in Sakhir was multiple world record holder Terry Grant. In one of his shows, the UK motor sport legend used one of TML’s cars and also performed one final stunt with the Maltese team members. Among the other distinguished motor sport personalities at the show were Lee Bowers, the Kawasaki offcial stunt driver, Saeed Almouri, the Saudi Arabia drift champion, and Abdo Feghali who holds the world record for the longest drift. In a statement, TML thanked Daniel Vella, from Kyokudo Racing, for making sure that during the three days of activities in Bahrain the cars were in top shape prior to each performance. That was no mean feat from all aspects considering the workload the cars were under during each stunt show.